The HoM awards went to David Westhead, and Henry Heavisides. Congratulations to them, they will receive technical running shirts from HoM sponsor UP & RUNNING. There was a great turnout of 15 junior Harriers. Henry H reports ... It was a bright & sunny day for today's Peco cross country organised by STAC. Conditions were very firm as a result of the severe overnight frost, it was a nice change from the mud at Nell Bank. Tom Adams had a fine win in the race, finishing well clear of the rest of the runners, despite wearing spikes, which were not recommended for the concrete bridges. Thanks to Kelly for taking on the final organisation of the team. The Presentation Evening was great fun, with 116 tickets sold and most of those people there it was a great social event. Thanks to Neil and Chris the organisers; to Complete Runner, Dobson & Robinson, Facewest, Cherie's Cakes, and Up & Running for the prizes for the Grand Raffle; and to the ILT&SC café-bar staff for all their hard work. At last we can reveal the results of the 2009 League, with Kevin Gooch the overall winner crowned at the Presentation evening. Top 50 overall, road, fell, trail/xc, and for the real statos the full Excel sheet to pore over. Congratulations to Lyn Eden for whom this was the final race in her '65@65' Challenge. We had 11 juniors racing too. 207  1:28:06  Sally Malir          3rd F45? Some snapshots Adrienne Heavisides here here. 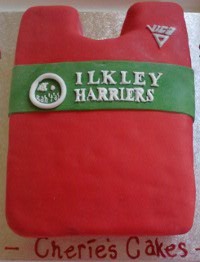 From Henry Heavisides ... there was a really good turnout of Ilkley Harriers at the Brass Monkey. It is one of the fastest half marathons around, with near perfect conditions today. We had 6 runners quicker than 82 minutes, led home by Justin Phillips who beat 80 minutes for the first time. Several of us were running close together which helped all of us to achive faster times than we might have expected. 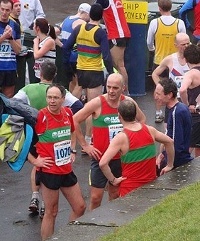 Many Harriers ran PBs, including Stephen Coy, Paul O'Looney, Andy Wiggans & Jane Bryant. I was pleased to finish first M55 and Sally Malir was 2nd F45. Andy Wiggans adds ... What a race! Absolutely one of my races of the year, I was lucky enough to get a place alongside a number of red and green vests, many of whom were starting frighteningly close to the front. (more ... ) I was struck by a large number of very thin, very intense looking people in general, but when you have Justin P, Paul O, Steve C and Henry H all looking lean and mean you know you're in trouble. Sally M and Jane B were also looking grim and determined, so I did my best to join in by talking about "pace" and "splits". Sean Murphy, undertrained but keen, decided to move away from all the thin people and start a bit further back. Also spotted by the start was Mr Verecondi, suffering from a poorly back so not running, but resplendent in something waxy and vaguely equestrian looking, and hanging around by the back of an estate car - all very "Twickenham west stand car park", or whatever the Antipodean equivalent is. Paul set off with his carefully calculated race strategy of "run as fast as you can til your legs fall off", and did the first mile in about 5:50. I with my more measured approach to things cunningly got myself boxed in at the start (to avoid being dragged into going too fast, you understand) and saw all my clubmates vanish down the road at a rate of knots. "They'll be back" I said to myself, trying to sound all wise and calculating. I had set myself a number of objectives for the day, the first of which was not to damage myself, particularly as I've had a bit of a niggle in my calf that led to me sleeping with Ibuprofen gel smeared liberally underneath a very tight tubular bandage. Secondly it was to run a reasonably even paced race, and thirdly, if all went well, to get under 82 minutes for the first time. I hit 5 miles in 30:40, so on track for objective 3, and 10k went by in 38:24, and all mile splits were in the 6:10 region. About 8m in I was expecting to see the distant flashes of red and green getting closer - but clearly my hare and tortoise strategy had a fatal flaw - the buggers had to slow down a bit, and they weren't. At all. By 10m (which I hit in under 62mins, which would be a PB if they'd been decent enough to put the finish line there, so goodness knows what time the lads did) they were starting to at least look like they were in same county, and it looked like a battle royal was developing - with Steve C catching both Henry and Paul, and the latter two swapping places a couple of times. I closed the gap slightly, but couldn't make any real impression, and was slightly disappointed to see my pace dropped by maybe 10s a mile in the last 5k - I'm not sure whether I sat back as I was on my own by this time, or (more likely) I was knackered. I managed to drag some speed out for the last 300m and crossed the line just behind Henry with 81:34 on my watch, which if confirmed, will be a 30s or so PB. We'll have to wait for the official results, but Henry must've broken both the V50 and V55 club records (confimed), Steve and Paul were close to cracking 81mins and Justin got under 80mins. There were lots of other great performances, which will no doubt be reported on by the people concerned, but in general this is an amazingly good race, with outstandingly good organisation and the best and most enthusiastic marshalls anywhere outside Ilkley. Oh - and my calf's fine, thank you for asking. A few hardy souls have kept their cross-country racing going long enough to run in the Northern Championships at Witton Park in Blackburn. Diane Haggar reports ... I have certainly "kept cross country running going long enough" in the sense that it is now 27 years since i started taking part in XC. The trip to Blackburn was a nostalgic one as i had last ran there in the Women's (yep, no men's races in those days) National in 1994. Arriving a little late I decided to forgo walking the course and rely on a 15 year memory!! A pity 15 years had erased the memory of the huge and multiple hills to be tackled on each of the 3 laps. However my attempts at fell running in the intervening years stood me in good stead and I came away very pleased with 84th. Interestingly close to the 86th I got on the same course 15 years ago, albeit in a larger National field. Showing how the sport has moved on for women I took 39.03 over a tough 8K course this time, but previously only 24.44 over what must have been a far shorter course in 1994. Kelly and Dave ran superbly, again showing how fell running makes you stronger on the country and, as Dave said, Cross Country makes you faster on the fells. A truth demonstated by Andi Jones (Salford, 2nd man) who regularly performs to a high level on Fell, Country and Road. A fab turnout of 75 Harriers (37 senior, 38 junior) in today's very tough XC. We had 2nd men's team (to Abbey) and 1st Ladies team. The course was tough going and the stream crossing may be talked about for some time to come... Thanks to Neil and Shirley for organising, to the famous Ilkley Ladies Catering Team who fed the 300, to the many, many marshals and helpers on the day. And a big thank you to the Nell Bank Centre whose fantastic facilities we enjoyed and to Mr Boothman whose fields we enjoyed. Lots of photos on our PECO race page. Lyn Eden reports ... After so many fell runs being cancelled since New Year�s Day because of weather I have been stuck on 63 fell runs in my attempt to complete 65 fell races in my 65th year. I must admit I was beginning to panic bcause I was so near yet so far and my birthday fast approaching on 7 Feb. The last straw was Ashurst Becon and White Holme Circular both being cancelled yesterday. But a window of opportunity arose today with the running of Firbank Fell Race, part of the Kendal Winter League series. It's approx 4 miles, 300ft climb. This has put me back on track to complete my 65th fell race next Sunday at the Stanbury Splash, which has always been my goal. Unfortunately it meant missing the Ilkley PECO, and apologies, but you seem to have had a superb turnout, and congratulations. Firbank Fell Race, like PECO had a bit of everything, boggy, icy, snowy and a stream crossing. It was just great to be out running again, as most of the other runners agreed. Tracey Greenway reports ... whilst most of the x country and fell races were cancelled this weekend Mercia Fell Runners decided to go forward with The Trig Point Race which is normally a 15 mile CL category fell race with around 1500ft of accent. This year due to the adverse weather they did shorten the course to around 12 miles, however thanks have to go out for deciding to go ahead when the pressure was on to cancel. 144 runners lined up for the snowy, icy start and each and all were counted though a start up funnel before the race proper got off to its official start! The Trig Point race covers an optimal route of around 15 miles from trig point to trig point around Cannock Chase and there is no marked route, however there are lots of people to follow who choose to just stick on the main gravel paths, a good look at the map is advised if you are looking for a fast time! I think I ended up taking a couple of poor options but some good ones too so I don't feel hard done by. It is at a great time in the year to get some undulating miles in and I will definitely do it next year and recommend it for anyone to get back into racing for the New Year especially if you are looking for something a little longer. On a personal note I was pleased with my run finishing 21st overall and 2nd lady in a time of 1hour 36 mins narrowly missing out on 1st lady on the run in, more speed work needed! The Race was won by Pete Vale of Mercia in a time of 1 hour and 19 mins. It's really well organised, well marshalled, with drink stations, and soup, tea and cakes at the finish that never run out. 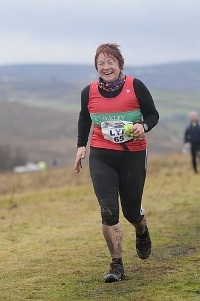 Lyn Eden reports on the Giant�s Tooth Fell Race, Ogden Reservoir, 3miles, 400ft of climb. Lovely day, very cold, overnight snow meant we had a bit of grip most of the way round except for one exposed icy climb. More a question of getting round in one piece rather than racing. Jim kindly ran with me. Andrew Bennett reports ... About 90 runners of all ages took part in this friendly 3 mile road race/ fun run and with nobody called Brownlee in the entries I thought I was in with a chance. Bob Payne had let me know about this antidote to over indulgence and I wrongly assumed he had run it before so what seemed like 4000ft of climbing came as a surprise to him too. Needless to say my earlier optimism was misplaced and I was the last of a select bunch of Harriers home. The after race presentations were very democratic based on the 'bring a prize get a prize' model.